Astrophotographer Ron Brecher took this image of NGC 669, a "polar ring galaxy", from Guelph, Ontario on September 19, 2016. 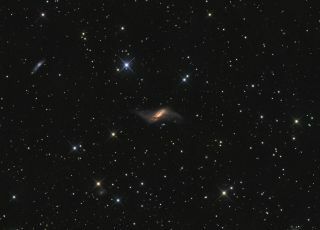 Near the center of this image is a galaxy that is a cosmic rarity, NGC660. Astrophotographer Ron Brecher took this image from Guelph, Ontario in Canada on Sept. 19. There are dozens of other galaxies in this field. The most prominent is IC148 in the upper left, lying about 36 million light-years distant. A light-year is the distance light travels in one year, or about 6 trillion miles (10 trillion kilometers). "Detailed dust lanes are visible [in the image], and the ring shows plenty of structure too. The ring is 50,000 light-years across; the galaxy about half that," Brecher added. Brecher used a SBIG STL-11000M camera, with Baader R, G and B filters, 10″ f/6.8 ASA astrograph, Paramount MX. Guided with SBIG’s external guide camera and 80 mm f/6.25 Lumicon achromatic refractor. Editor's note: If you have an amazing night sky photo you'd like to share with us and our news partners for a possible story or gallery, send images and comments in to spacephotos@space.com.